While the AL MVP won’t be announced until Nov. 21, I didn’t want to go an entire year without writing a blog post and so I felt it necessary to get something out before Nov. 15 hit. As I’ve indicated in the past, there are no bigger frustrations in my life than those dealing with the decisions of the BBWAA. This year, I’ve let my guard down some and fully expect some irrational votes to take place that question the integrity of the game. I also want to decree that I’ve become a big proponent of the WAR* stat (Wins Above Replacement) which allows any player to be judged against another regardless of position. That being said, I wanted to state my case for the most contentious award of the season in my mind; AL MVP. We’ve learned throughout the years that the MVP is historically regarded as an award rewarding batters. In all fairness, pitchers already have an award to compete for amongst themselves. However, unless the committee comes and declares pitchers ineligible for the award, it’s fair game to me to include pitchers in the discussion for MVP. The last such winner came in 1992 in the form of RP Dennis Eckersley. I may have been too young at the time to fully justify that decision, however I’ve been witness on at least a couple of occasions in my active viewing lifetime where pitchers were robbed of the award (primarily from voters taking it upon themselves to decide whether pitchers were worthy of the award). This year, the honor of AL MVP should be awarded to Justin Verlander. Numbers alone don’t tell a lie… 24-5 (1st, no other AL pitcher having won 20 games), 2.40 ERA (1st), 0.92 WHIP (1st), 250 K (1st), 0.192 BAA (1st), 8.5 WAR (T1st, +1.7 from next best pitcher) all the while leading the Tigers to an NL Central division pennant. The rest of the Tigers pitching staff had ERAs in the forms of 4.43 (Scherzer), 4.47 (Coke), 4.75 (Porcello) and 5.30 (Penny). Other regular season highlights include a no-hitter May 7 vs. Toronto, June AL Pitcher of the Month, and a 12 consecutive game (decisions) winning streak in the July-September stretch run. Even 4 of his 5 losses were considered MLB termed ‘tough losses’ having allowed 3 ER or less in 6 or more innings of work. Pretty similar lines however some obscurities from that year include the fact that Clemens’ WAR was not only not the best pitching WAR in the league (Teddy Higuera, 8.4), it wasn’t even the best WAR on his own team (Wade Boggs, 8.6). Two other AL pitchers also won 20+ games that year (Jack Morris , Teddy Higuera ). Mark Langston even had more strikeouts (245) which meant no pitching Triple Crown achievement. Verlander’s season has to be considered most valuable than that. Ellsbury to me had the best shot at challenging Verlander for MVP. However, that was lost when the Red Sox let their playoff hopes slip away in an epic September collapse. No MVP should be part of that. Even Cabrera puts up a good argument with his average alone. However, the power numbers are a bit suspect and ended up playing second fiddle to Gonzalez for 1B Silver Slugger honors. Bautista is an interesting case given the MLB-high WAR and batting average improvement over last year (in lieu of a slight decline in power numbers). Without him in the lineup, the Blue Jays finish 5th instead of 4th in the AL East? Doesn’t seem like justification enough given the rest of the field. MLB awards history indicates that no AL MVP has had a batting average as bad as Granderson with the closest being Roger Maris in 1961 (.269) when he also belted 61 homeruns. Cano and CC also greatly diminish Granderson’s chances. 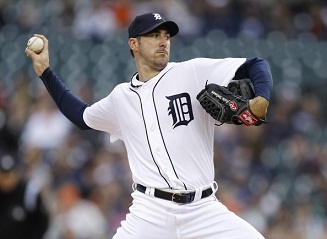 Factors that could go against Verlander include: Cabrera being an MVP candidate on the same team, Jose Valverde being perfect in save situations helping close out games (49/49), or the fact that the Tigers played in the worst division in baseball. None of these cases is strong enough to dissuade the ultimate decision however. Let justice be served BBWAA writers and have the best man win (otherwise, you’ll be seeing another hate post from me in one year’s time). This entry was posted in Sports and tagged BBWAA, MLB. Bookmark the permalink. Both comments and trackbacks are currently closed.